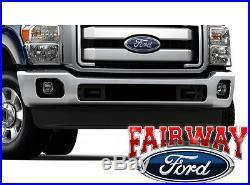 11 thru 16 Ford Super Duty F-250 F-350 OEM Ford Parts Fog Lamp Light Kit XLT Model. 2011 thru 2016 Ford Super Duty F-250 F-350 F-450 F-550 Fog Lamp Kit (XLT model). Add the OEM Factory Fog Lamps to your new Super Duty! Brand New OEM Genuine Ford Parts! This kit is especially designed for XLT Models only - Though it May Work with Your XL Model - Read Below! For optimal vision and safety. Fog Lights mount to the lower fascia of the front bumper with original equipment design that ensures proper fit. This is a complete kit that includes both RH & LH fog lamps mounted on brackets with new bulbs installed, RH & LH fog lamp bezels, proper automatic headlamp switch with fog lamp control, and wiring harness with factory plug-in connectors. All hardware and instructions are included from the factory. This kit has the ability to add the automatic headlamp feature to those XLT trucks that do not currently have that option by using the included light sensor! This kit will work straight "out-of-the-box" without any programming on any XLT model. If your XLT model didn't have the automatic headlamp feature, and you want to add that option, then you will have to have programming done at your local Ford dealership to allow that feature to become operational. If you have an XL model truck, and it has power windows and power door locks, then this XLT kit will work in your truck. You will not have the opportunity to add the automatic headlamp feature, but everything else will work perfectly on your XL model "out-of-the-box" with no programming needed. Fits all 2011 thru 2016 Super Duty XLT model trucks. If you are unsure of your application please contact me with your VIN (vehicle identification number). Brand new Genuine Ford Parts! This is a Genuine Ford Brand Accessory that is designed, engineered, and built specifically for your Ford vehicle. Ford has made every effort to ensure that their Genuine Accessories are top quality in terms of fit, finish, and ease of installation! We Go the Extra Mile for our Customers! If you have any questions please feel free to contact me! Fairway, It's Not Just A Name. That's The Way We Do Business! Please keep this in mind when attempting to contact me. We strive for excellent customer service! UPS Next Day Air and 2nd Day Air service is available at a discounted rate. We accept all major credit cards. The item "11 thru 16 Ford Super Duty F250 F350 OEM Ford Parts Fog Lamp Light Kit XLT Model" is in sale since Thursday, March 06, 2014. This item is in the category "eBay Motors\Parts & Accessories\Car & Truck Parts\Lighting & Lamps\Fog/Driving Lights". The seller is "fairfome" and is located in Canfield, Ohio. This item can be shipped to United States, Canada, United Kingdom, Denmark, Romania, Slovakia, Bulgaria, Czech republic, Finland, Hungary, Latvia, Lithuania, Malta, Estonia, Australia, Greece, Portugal, Cyprus, Slovenia, Japan, China, Sweden, South Korea, Indonesia, Taiwan, South africa, Thailand, Belgium, France, Hong Kong, Ireland, Netherlands, Poland, Spain, Italy, Germany, Austria, Russian federation, Israel, Mexico, New Zealand, Philippines, Singapore, Switzerland, Norway, Saudi arabia, Ukraine, United arab emirates, Qatar, Kuwait, Bahrain, Croatia, Malaysia, Brazil, Chile, Colombia, Costa rica, Dominican republic, Panama, Trinidad and tobago, Guatemala, El salvador, Honduras, Jamaica.